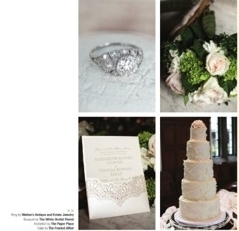 The NFocus January 2014 issue features a collection of everything bridal, including stunning antique jewelry from Walton's! Our gorgeous array of 1920's diamond jewelry paired beautifully with the designer gowns, bouquets and decor that were photographed for the bridal shoot. For the full spread, check out nfocusnashville.com or pick up a hard copy in numerous local Nashville boutiques.